Can a quiet novel written about a self-effacing, reflective character named Ben draw you in and transport you from the miasma of current events? 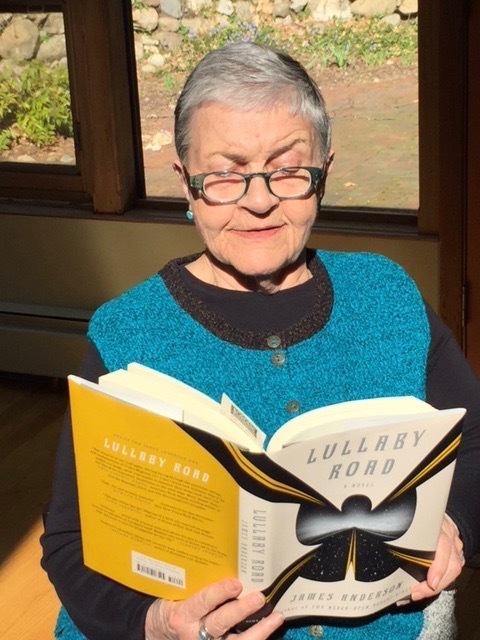 I am grateful to my Solstice MFA colleague, James Anderson, for creating Lullaby Road, his second book about Ben Jones, a twenty-eight-foot tractor-trailer driver in the high desert of Utah who embraces the expanse of isolation and space while surrounded by characters with challenging circumstances. I rarely had sharp discussions with my customers. I rarely had discussions at all. Silence joined with indifference to keep conversation to nods and shrugs. Sometimes it almost compensated for how long it took some of them to pay me. Every aspect of Ben’s life—the landscape, troublesome and endearing customers, friends and loves still on this earth and those who have passed—are woven into the fabric of this novel. Yes, Ben is fictional, contained on the pages of a book, born from Anderson’s imagination. Yet, he is real and lingers long after I leave the page. Characters, such as John The Preacher, Ginny, a teen, the Doctor, serve to speak the author’s truth. Combination philosopher, poet, human being with a high moral code, and exceptional story–teller, Anderson commits to bringing us a character of moral integrity. Ben Jones is the antithesis of Washington insiders, the subjects of our everyday news, the stories in which we are drowning. …too damn often a gun might seem like a preserver….I considered them a tool…carrying one around all day was like putting a wrench in your pocket in case one of your nuts came loose. In my experience it seemed that once you started carrying the wrench you started suspecting everyone’s nuts were loose except your own. I met Ben three years ago in the pages of Anderson’s first book, The Never-Open Desert Diner.It was a page-turner, part mystery, love story and desert journey. I have been to the Southwest desert twice. Both times, I welcomed the change from the frenetic pace of the East coast as I entered the ease of meditative wanderings evoked by the landscape. At the end of the day, tucked into the quiet night, I am drawn to the next phase of Ben’s journey. Satisfied and grateful for each well-crafted chapter, I sleep well, often dreaming of red adobe mountains, desert, and endless, high-country highway. This entry was posted in Creativity, Currents, Happiness, Mindfulness, Nature, Politics, Relationship(s), Uncategorized, Well-Being, Writing and tagged desert landscape, John Anderson author, meditative writing, moral protagonist on April 23, 2018 by fayewriter. I was grateful a local friend had posted the picture and wanted to pass it on for others to see. It felt like a breakthrough, perhaps an opening of meaningful dialogue. As a therapist, I am always curious about what particular image or piece of information draws us in and stirs meaningful links. On the surface, I was drawn to a hopeful feeling by this man’s poster. 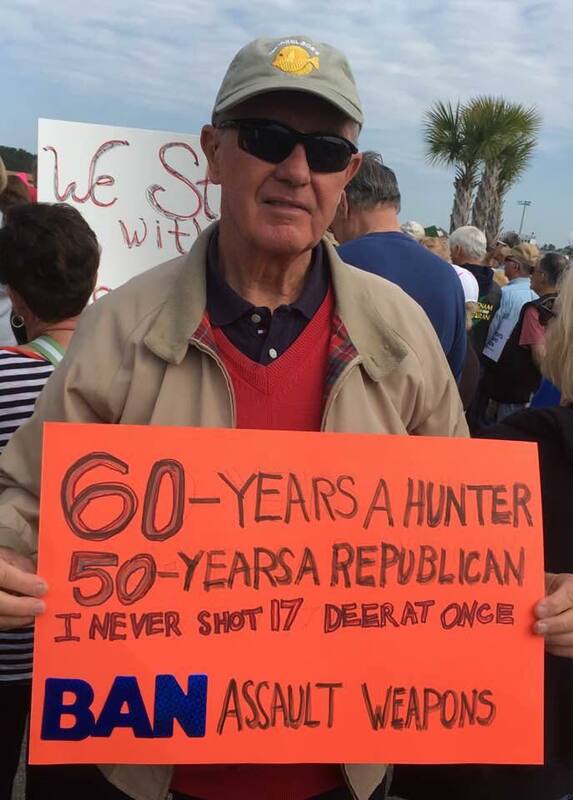 Only when I began to write this blog did I realize my long history with hunters and gun violence. I first encountered the violence a gun could render on the front stoop of my home on Route One in Portland, Maine. My parent, especially my mom, was protective. It would never have occurred to her to shield me from sitting on the front stairs. Every fall, I watched a parade of deer strapped to station wagon rooftops as hunters drove homeward from the Maine woods. I had no words, just the raw instinct of a child’s first sight of a bullet wound circled in blood on a gentle “Bambi’s” chest. Years later, this poem emerged. riding atop a station wagon. had gone straight through herself. from that endless caravan of prey. Years later, she would learn of other carnages. Already, she knew to cry. Only once, on a trip to Alaska, to visit a friend and colleague, have I been party to men shooting guns at close range. Our host, a liberal and Alaskan enthusiast invited us to join a friend’s dinner party to try “bear” steaks. Because I had cut back from eating meat, I was hesitant but drawn to what was described as an “Alaskan adventure.” When the brown-crusted steaks were served, I took one taste and pushed my plate away. It was far too tough and gamey. But the highlight, for the four men, was the opportunity to target practice in the backyard with a pistol and live bullets. I watched from the window, repelled and repulsed by the sight. Even for “fun,” watching through a window at a safe distance, the shots rang straight through me. I’m grateful to the committed teens who have lived their lives under the threat of school shooting violence and who continue to stand firm in their #Never Again resolve. This entry was posted in Creativity, Currents, Mindfulness, Politics, Relationship(s), Sustainability, Uncategorized, Well-Being, Writing and tagged anti gun violence, ban assault weapons, Never Again on April 9, 2018 by fayewriter.